TAP Elite Library Bound Simulated Leather Professional Wedding Albums. 3 Colors: Medallion-Black Cover with Black-Edged Pages, Silverado-Black Cover with Silver-Edged Pages, & Pearl-Ivory Cover with Gold-Edged Pages; Page Capacities: 10, 12, 15, 18, & 20. 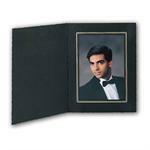 The library-bound Flora wedding photo album is a flex-hinge bound-book with a wraparound cover. Available in 5x5, 8x8, & 10x10 sizes. Colors available: Medallion ( black ) cover with black edged pages & Pearl ( Ivory ) cover with gold-edged ivory pages. Bonded leather; bound construction; individually boxed; album sizes: 4x5, 4x6, & 5x7; page capacities: 10 and 15; colors: Black and Saddle. Individually boxed. Custom Imprinting is available. Merit Albums, Inc. at 19438 Business Center Drive, Northridge, Los Angeles, California. Call Our Toll Free Phone Number: 1-800-423-5546 between 9:00 a.m. to 5:00 p.m. PST.